My character in our group's Mutant & Masterminds game. We took a few of their settings and altered them to our liking and call it The Ultimate Freedomverse...sounds cool, right?? Standing approximately five and a half feet, Marinna has a rich mocha colored skin tone and long, dark brown, slightly wavy hair. Her eyes in extreme contrast to her otherwise dark features are an icy blue. Overall she is long and shapely, sporting a very light amount of muscle tone. Marinna dresses conservatively while in school, mostly business casual, but otherwise prefers to wear clothes that show off her attractive physique while remaining stylish and tasteful. Marinna was born in South America, specifically Brazil. Though she doesn't remember any of it and the only thing she knows is that her mother, a woman of Spanish origins, immigrated to America with her twin sister when she was only a year old. Her mother, Maria Castillo settled them in a small town surrounding a prestigious medical college in Texas, taking a job as a cook. It wasn't long before Maria met a visiting professor names Alistair Philips and the two fell in love. It was no surprise that when Alistair returned to his practice in Maine, he had three extra people in tow. Alistair became nothing less than the twins loving, doting father. He and Maria were married soon after. Marinna was a shy, awkward girl during her adolescence and frequently her sister, Isabela, was her only playmate. Although that suited the twins just fine often enough. With her mother opening a small, Spanish themed restaurant and her fathers private practice Marinna and her brother lived a perfectly normal, well provided for life. Within a few years Maria and Alistair made their family bigger by introducing the girls brother, Julian. Although both the twins shared a love of music, Isabela excelled and eventually started a small-time band with some of this high school buddies. Marinna found a natural flair and love of science and engineering. During that time she also blossomed into a rather exotic beauty, earning herself more than a few admirers during her senior year in high school. Marinna decided to try (and succeed) enrolling in the Freedom City University's engineering department so that she could someday give something back to the US, the country that seemed to have given her everything. She left for Freedom City late in the summer following her graduation from high school. College, and the City agreed with Marinna. Discovering the freedom of independence, she spent a lot of her time partying with the friends she made, including her current roommate Becca Fox. Marinna also discovered dating, which she liked almost as much as the chocolate coffee she cherished from the local coffee shop, Starbase. However, after several dead end relationships and a lousy date with a teacher's assistant, Marinna decided to focus more on her studies than her social life. One day at Becca's insistence, Marinna was watching old footage of the Liberty League. One member in particular, Freedom Eagle and his anti-gravity suit caught her eye. Finding herself determined to recreate the device she began work a few weeks later after finding a workspace in an unused part of the campus. A few months later found a completed suit, minus a power source. The daka crystal that had been used for the original frustrated Marinna and she tried to find an alternate to the rare and almost unobtainable crystal. She researched alternate power sources for weeks, without success. She thought the project a bust until one day she came into her lab to find a large piece of the crystal sitting on her workbench. Soon after that the Freedom Eagle made his...er...her reappearance to the citizens of Freedom City. Marinna deliberately kept her outfit very similar to her predecessor. 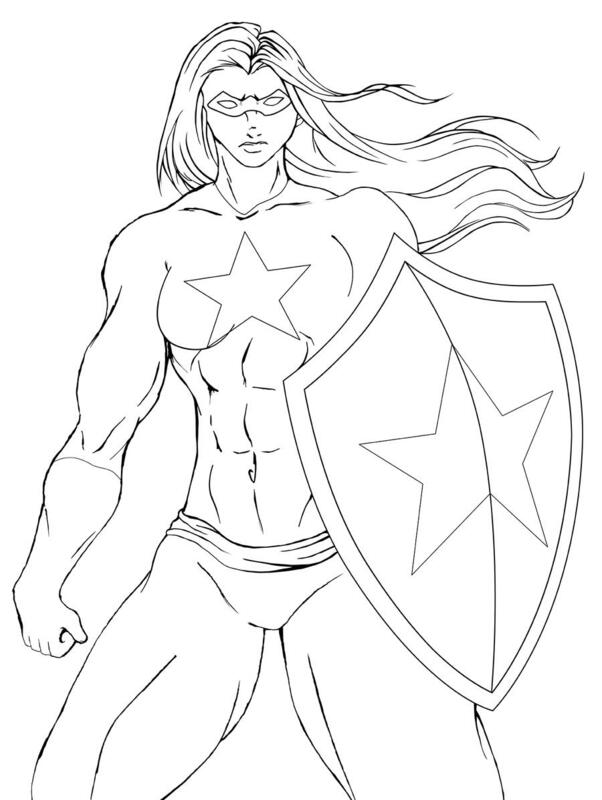 She quickly befriended some other heroes in the city: The Patriot and Arrow. Together they reformed the Liberty League and inducted a fourth member, the Druid, into their ranks after working with him a few times. Marinna gets along with everyone on the team and has come to see them as her family. She has grown particularly close to Tiffany Walker (aka The Patriot), the two spend almost all their free time together. This is the second Patriot in my group's Mutant & Masterminds game. We took a few of their settings and altered them to our liking and call it The Ultimate Freedomverse...sounds cool, right?? She was created by the lovely and talented Kythkyn. Tiffany stands a modelesque five foot nine inches. Her eyes are deep blue, her golden blonde hair is voluminous and slightly teased, falling just past her shoulders. Her body is extremely toned and fit, though she still preserves her feminine curves. Outside of her costume, she usually dresses business casual. Tiffany was born in the Midwest to John and Martha Walker. From a young age Tiffany excelled at physical activities, gymnastics above all else. By her teen years she became an up and coming Olympic hopeful, with the talent to win the gold. Unfortunately, fate had a different plan for the young gymnast. Driving home late one night with her parents, coming from a late training session, the Walker’s car was hit. John and Martha walked away with only minor cuts and bruises, but Tiffany took the brunt of the damage, mangled in the back of the car. After intensive physical therapy for a few years it became clear to John that his daughter would not only never become that Olympic gold medalist, but she would barely be able to walk. As a scientist for AEGIS, John knew there was something he could do for his daughter. He broke into the archives and found the formula for Project Patriot. It became John’s mission to procure the fabled Makana root and attempt to recreate the secret formula that was used to create the Patriot back in 1942. In the AEGIS laboratories in Freedom City John replicated only a small amount of the formula, but it was enough to give the nineteen year old Tiffany back not only her ability to walk and her gymnastic prowess, but it greatly increased her muscle mass and her manual deftness. Although the experiment was more than successful, John’s methods were seen as bordering on treason. In lieu of John being tried, Tiffany agreed to join AEGIS as an operative. With her strong patriotic upbringing as well as the more than obvious link to the previous Patriot who had passed in 2000, Tiffany was given the code name The Patriot. Along with her new AEGIS ranking and responsibilities, Tiffany was also outfitted with a suit of Impervium as well as a Patriotic Impervium shield by ASTRO labs. 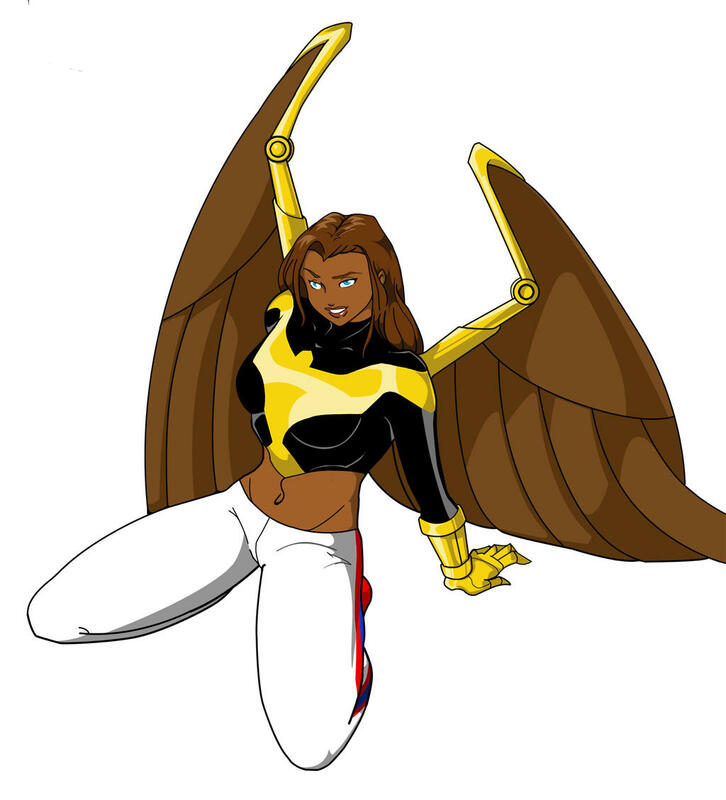 After her intense training and her abilities (as well as the abilities of the experimental Impervium armour and shield), Tiffany joined Freedom Eagle and Arrow, taking on the role of team leader for the reestablished Liberty League. With Tiffany’s father moving back to the Midwest, Tiffany took up residence in the newly remodeled Liberty League Mansion. When she is not leading her team on missions or working with AEGIS to keep Freedom City safe, Tiffany enjoys making use of the Mansion’s Olympic sized pool and gymnasium. She also enjoys keeping up with the Freedom City Comets (that’s baseball for you folks not in the know) and taking the occasional (read: frequent) trip to the local Starbase Coffee to get espressos or iced cappuccinos. Every Sunday Tiffany heads to St. Stephen’s Methodist Church to attend services. Recently, Tiffany has been spending more time with her teammates, and with Marinna Philips in particular. Although there is an obvious friendship, and maybe even something more, neither Tiffany nor Marinna have confirmed the rumour. Very nice! Clean lines, nice abstraction, and the faces are different enough (almost a different style). Not digital, all hand and crappy phone camera until we get a scanner that works. 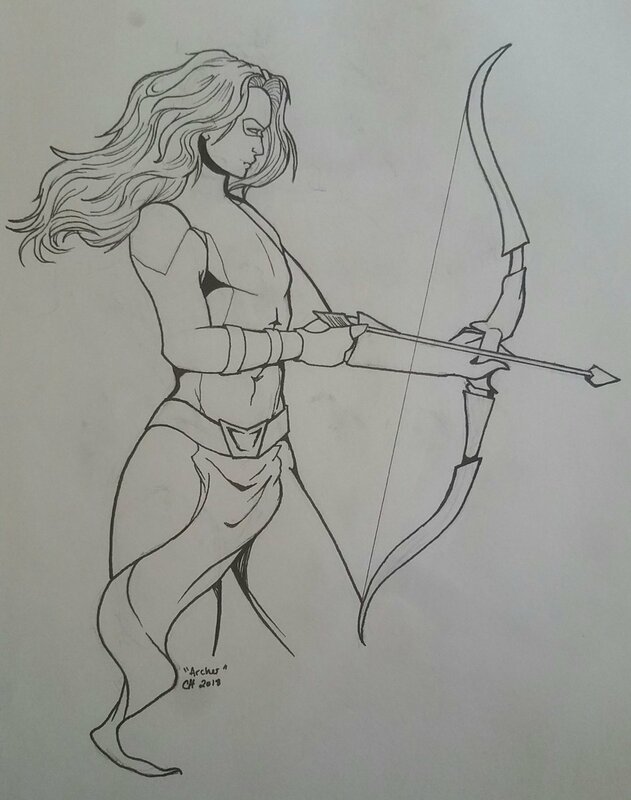 Kythkyn will explain Archer's backstory, because she's her character. Either way, enjoy!